A 12 session course that teaches a dynamic set of social and emotional skills which cultivate character development and support thriving and fulfilling relationships. The program includes interactive discussion, journaling, roleplay, and in-class assignments. 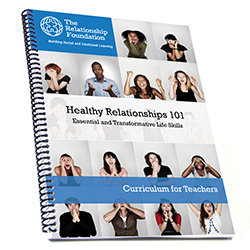 The coursework helps students discover how to assess their needs and feelings and define relationships based on their core values. Click HERE or below to request a FREE copy of the Bully Prevention session, along with the Healthy Relationships 101 Table of Contents, and Adverse Childhood Experiences (ACEs) information. Click HERE to read reviews of our curriculum from educators across the country.